Writing for the multibillion-dollar video-game industry is unlike writing for any other medium. Slay the Dragon will help you understand the challenges and offer creative solutions to writing for a medium where the audience not only demands a great story, but to be a driving force within it. Aimed at traditional writers who want to learn interactive narrative as well as game creators who want to tell better, more emotionally involving stories, the book is written by Robert Denton Bryant and Keith Giglio, two creative veterans of both Hollywood and "Nerdyhood". 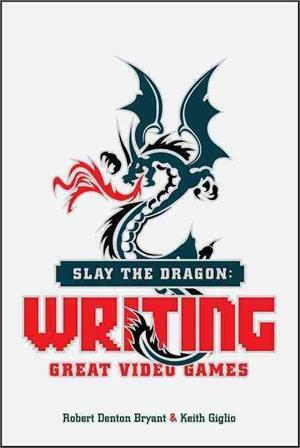 Through lively discussions and self-paced exercises, Bryant and Giglio teach you such topics as: the "no-act" structure of video games; writing great game characters; making gameplay emotionally meaningful; and bringing your game world alive. Robert Denton Bryant has worked in Hollywood in both marketing and production, and in video games as both a publisher and a developer. He has been executive producer on dozens of popular games for home consoles, iPhone, iPad and PC/toy hybrids, including the bestselling World Championship Poker and Pinball Hall of Fame console game franchises. He has lectured in the U.S. and Europe on game writing, and is currently director of the interactive game studies program at St. Edward's University in Austin, Texas..
Keith Giglio has worked as a screenwriter and producer on such feature and television movies as Joshua, Noah, Return to Halloweentown, Walt Disney's Tarzan, Pizza My Heart, A Cinderella Story, and Another Cinderella Story. He has written for Paramount Pictures, The Walt Disney Company, Universal Studios, Warner Bros. Pictures, Spyglass Entertainment, Walden Media, Tokyopop, and Platinum Studios. He currently teaches both screenwriting and game writing at Syracuse University.